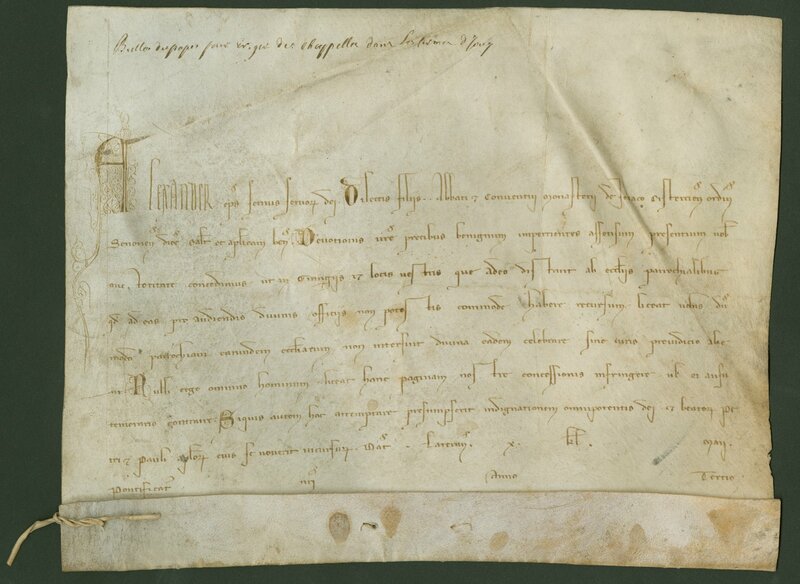 Thirteenth-century, Italian papal bull addressed to the Cisterican Abbey of Jouy-en-Brie (Cottineau 1:1492) giving permission to celebrate divine office in their remote farms and places which are not easily accessible to parish churches. Produced in Rome and dated 22 May 1257 in the document. An 11-word French inscription along the top: "Bulle de pape..." Inscriptions on the dorse: "Alexander Pape Bulle_Jouy" and an illegible medieval inscription. Purchased by Special Collections, Waldo Library from Mackus Company, Fairlawn Ohio in May of 2003. Housed in a modern mat frame (281 x 355 mm). Bulla missing, holes for seal cords visible. Parchment tie still attached to lower corner. 2-line, pen-flourished "A" opens the text; other single color, single line, pen-flourished initials passim.